One of my favorite things to do is talk with older adults about their memories of foods from the past. Maybe it’s a food from childhood dinners, or maybe it’s a freshly-baked roll from an elementary school lunch tray. I remember my Granny talking about how her family almost always had cooked beans on the stove, and how they made their own sauerkraut in a big crock in the kitchen of their cabin in Hardin County, Kentucky in the 1920s and 1930s. Today, not too many of us are making kraut in our crocks on the counter anymore. The foods we eat and the ways we cook have changed over the years – in some ways for the good, and in other ways for the ……..well, no-so-good. Looking back at old ways of eating, thinking about food history, and how our food system has changed fascinates me, and I want to invite you to join me for a “Way Back Wednesday” (#WBW) series here on the Food Smarts Blog. We’ll be taking trips back in time, remembering foods and recipes from the past, and transporting them into the present. For our first Way Back Wednesday journey, I wanted to focus on a recipe that you can make right away. You don’t need to be a skilled cook for this one. In fact, if you have kids at home who need a fun activity to do today, this is a great recipe to “assign” your kids as a summer learning project! All they’ll need from you is a little help with three knife cuts. This 87-year-old beauty is filled with Depression-Era wisdom. 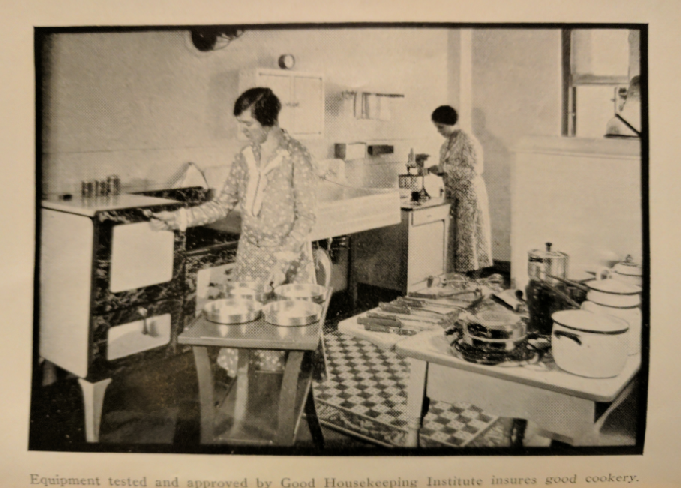 Testers at the Good Housekeeping Institute, from p. 1, captioned, "Equipment tested and approved by Good Housekeeping Institute insures good cookery." Today when we think of desserts, we think of pies, cakes, cookies, and ice cream; but in 1930, a popular delicacy was fresh melon. Back then, people didn’t have year-round access to fresh melon the way we do today. It was truly a seasonal item, and melons were actually regional! If you lived in the southern U.S., you may have eaten some of the same melons we commonly see today, such as cantaloupe and watermelon. Up north, you might have had the famous (and now nearly impossible to find) Montreal Melon – kind of like a cantaloupe, but with a green/yellow flesh more like a honeydew. The Montreal Melon was so famous, in fact, that it sold for what today would cost $24.00 a slice! Interestingly, throughout this book, berries seem to be presented as less-exotic than melon. This is very different from today. I can only speculate, but it may have been that since various berries grow well throughout the country, more people may have had access to berry bushes/vines. In other words, berries may have been easier to come by than melon. Any way about it, though, fresh fruit was a delicacy. Today, we think of fruit for dessert as a "healthy alternative," rather than a fancy option. Imagine if you could only have fruits a few times a year. Think about how fruit would have been an expensive treat, due to its rarity. Imagine how unusual an all-fruit dessert might have been in a time before the grab-and-go fruit cups of today. In the 1930s, cooks took time to cut, arrange, and garnish fruits to serve them beautifully. This is, in some ways, a lost art in the home kitchen, but it's so easy to bring back. A beautifully arranged fruit dessert can still wow your family and friends. Nutritionally, this dessert is a total home-run. For kids, this recipe is easy-to-make, and it may increase interest in melon for young kids trying new foods. The round orbs of juicy cantaloupe look a little like sherbet scoops, or bouncy balls, or tiny suns -- just imagine what you might have thought as a kiddo. So fun. Do be aware that round-shaped foods like melon balls can present a choking hazard for very young children. Always make sure your little ones have manageable bites for their safety. For those with food sensitivities, this dessert is naturally dairy, soy, nut, egg, and gluten free, since it's made only from fruit! And, for those who prefer a plant-based diet, it's naturally vegan. Make sure to wash the exterior of your cantaloupe thoroughly before cutting into it. Rinse berries in cool water. Slice the melon in half, and sit each half on a plate. Scoop out the mushy/seedy core and discard. Use a melon-baller tool to gently scoop out the cantaloupe flesh into balls. This is a fun job for kids and is a fun way to work on fine-motor skills. Just a simple scooping motion (imagine making tiny ice cream scoops) will produce beautiful orbs of fruit. Be careful not to scoop too low, or you'll go through the bottom of the canteloupe. The idea is to create a "bowl" from the melon's rind. When you've finished scooping out all the melon balls, mix the canteloupe and raspberries together and put back into the empty melon rind like a bowl. Voila! How beautiful. I decided to pile all my fruit into one side of the melon rind, but you can use both sides if you want! The tool you see on the right is a melon-baller. This one has a small and large end. Optionally, you can dust the final product with a little snowstorm of finely-powdered sugar as a garnish, but it's not necessary. The fruit is naturally sweet. If you're like me, you'll probably be eating straight out of the melon at this point, but if you want to be authentic to the time-period, this dessert likely would have been served in small bowls or ramekins, or in flared glassware on a saucer with a dessert fork, as shown below. If you dust with sugar, do so right before serving or the sugar will dissolve and disappear! Really though, you don't have to be fancy. You can even skip the whole putting-the-fruit-back-in-the-melon bit if you want. A regular bowl is just fine! If you don't eat it right away, it'll keep for three days in the refrigerator in a covered container. This recipe makes enough for 5-8 people with modern dessert-size servings, and probably up to 10 people with 1930s style servings. Also -- from start-to-finish, this recipe will take you NO MORE than 10 minutes. (Maybe longer if you let an 8 year old do it.) It's so easy, so fast, and so creative. Please share your food memories and #WBW ideas in the comments! If there's a particular memory you have of food growing up, I'd love to hear about it. Also, if you tried this recipe and enjoyed it, or decided to change it up a bit, you are invited to join the discussion in the comments below, or on Facebook or Instagram. Weekly Q & A – Babies. Ketosis. And Misinformation. Website Designed by Johanna Ehnle.